After the horrible fights and shootings at the 49ers-raiders game last month, we applaud the tougher security and the new curfew on tailgating. They’re good steps -- but not enough. 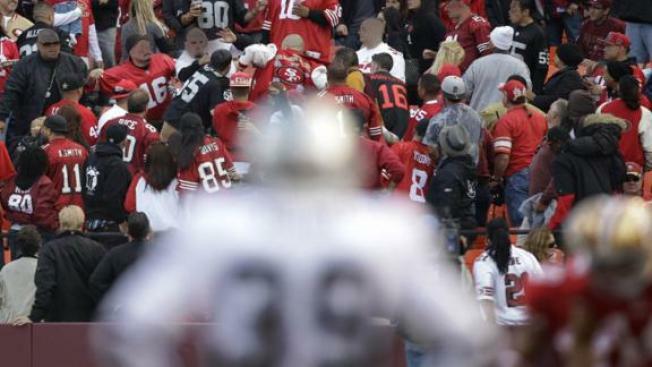 49er CEO Jed York was on the right track last week… leaving his skybox to sit in the stands with his wife. It was a nice photo “op” but not what the rest of us experience. NBC Bay Area challenges you, Mr. York, and Raiders’ CEO Amy Trask to walk through your stadiums and parking lots incognito wearing the rival team’s jersey! Until you feel safe doing that, the public won’t feel safe. Owners must be willing to cut or even ban alcohol, they must permanently ban violent fans, and take whatever steps are needed to assure us that what happened never happens again. Join the debate at NBC editorials.com. Please scroll down to view comments or leave your own. If you would like to leave a longer response, you can also submit comments via email at editorials@.nbcbayarea.com.